Passive Solar Modern Prefab Home Off Grid Wells, Cisterns, Ball Lightning, Log Homes, and Tree Frogs! 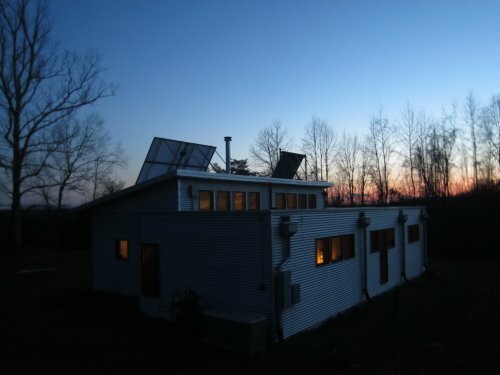 Off grid prefab house, still with broken window. And so last week ended with the off grid prefab home's cistern running dry, thanks to an unnoticed bent gutter that prevented the full volume of rain water from reaching the prefab home's cistern. Handsome Husband fixed the gutter, left for DC, and then we all promptly came down with achy runny massive head colds. And fevers. With no running water. ...and halleluiah, awoke to rain! Would it be enough? Was the gutter truly fixed? I was feverish, dazed, waking oddly only noting changes in weather: the comforting drizzling, the tempests, the fog. When I rose out of bed, I expectantly turned the kitchen faucet: nothing. Feverish, Pipsqueak 1 and I opened the cistern: there was water. What is wrong? Is the float indicator caught in the cistern? Who knows, at that point I was too sick to continue on. 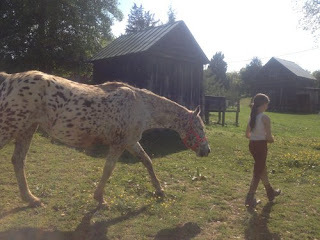 So I, daily, in the rain, thunder, and lightning, with fever, would muck the horses' run in, make sure the chickens were fed, slosh back to the car, and head out for a refill of the camping cube of water via the Wonderful B's, which I rationed out carefully, to be refilled again the next day. The only thing I thought was, "I will deal with this when I'm not sick." What IS The Etiquette of Asking For Water? 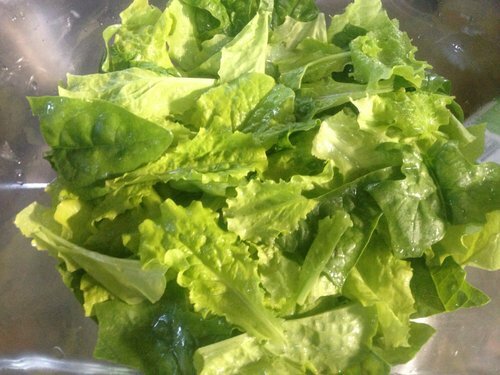 There is nothing more dependent when you come to friends for life's essence, water... Thankfully, the B's sent us cheerily home not only with water, but even bags and bags of fresh salad. We quietly asked for water, they sent us home with food and drink. For movie night, we watched this. 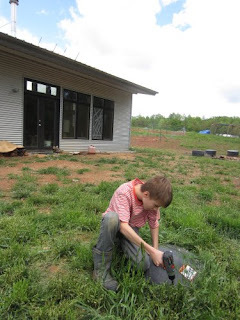 For many reasons, it is time to hurry up on the Equine Well / Backup Cistern Plan at the off grid passive solar prefab home, asap. After a few days of sickness, recovered but still not great, I headed off to the Amish neighbors, who pointed me down the road to Amish Mr. Y. He's the one 'round here who sells the pumps they use in Amish wells. 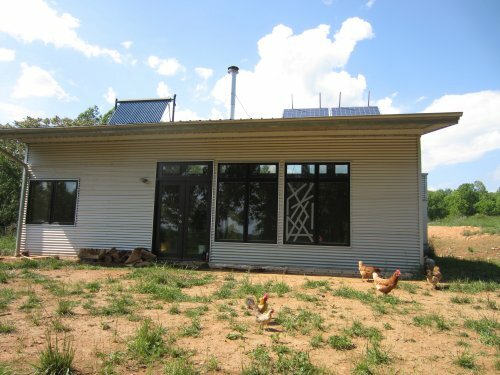 I explained to Mr. Y that because out house is off grid, already using rainwater collection / a cistern, and that our solar power for our prefab home is sized minimally, we don't want to tie in *anything* to our existing system, but prefer to have livestock power on its own, seperate system- solar, air, gas... we are exploring the options. The red is where the water pipe goes. 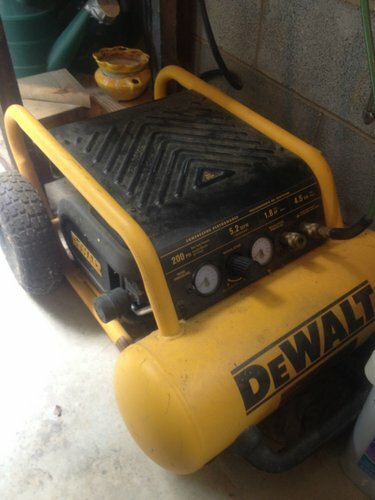 Mr. Y: "For you, I would recommend gas powered, not diesel, it would be less expensive. 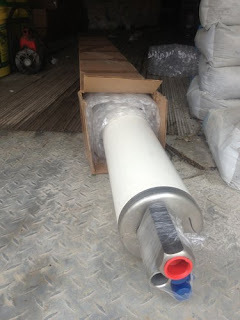 Also you would only be using it for a few horses, so you don't need something very heavy duty..."
Delirious, I headed on to my friends The B's for more water on the way home. 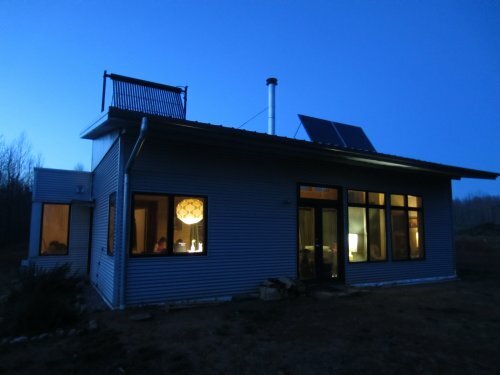 Mr. B, before retiring, was our Fabulous Contractor who put together our off grid prefab home! He looked at the picture of Mr. Y's well pump. "Huh. You know... 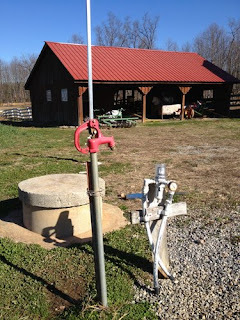 I wonder if that pump also has an air pressure tank? It looks like it might? I also wonder if you could even get away with using an air pressure compressor that's portable, hooked to your portable generator- I have used my portable air pressure compressor plenty of times on your generator, fine!" I am going back to Mr. Y this week to get more information, ask more questions, and down to Charlotte Court House to file for a well permit. If I'm well enough, I might even give Mister Y a hug. It was hard, each errand I did. I would come home and just collapse, sleep, waking late in the evening, to run and feed the horses, throw out dinner, then collapse, again. been able to make it without them. 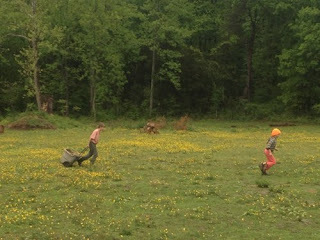 Here they are taking the muck bucket to Mont Poop. But wait! Remember when we were watching the Rime Of The Ancient Mariner? I think the Mariner, Like I, Saw Ball Lightning. "Ball lightning reportedly tends to rotate or spin and can possess odd trajectories such as veering off at an angle or rocking from side to side like a leaf falling. Ball lightning can also move with or against the wind. Other motions include a tendency to float (or hover) in the air and take on a ball-like appearance. Its shape has been described as spherical, ovoid, teardrop, or rod-like with one dimension being much larger than the others. Many are red to yellow in colour, sometimes transparent, and some contain radial filaments or sparks." 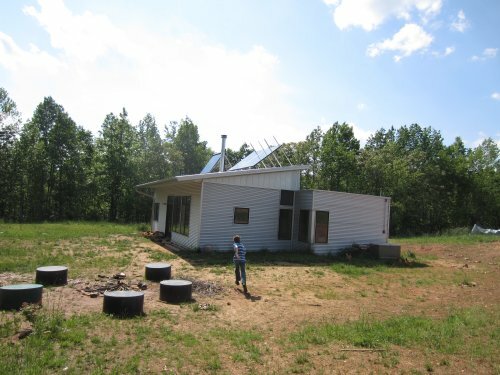 YES: Spooky Story At The Off Grid Modern Prefab! I was sick. I just wanted to watch a movie. I turned back to my laptop. ZING! A white spinning shape, edged with red, appeared! And another! So what did I do during this ethereal event?